NEW - This in depth, professional course, created by Silvia Hartmann, is for those wishing to become a Certified Energy Healer For Animals in Eight Units. This course is designed to give the successful student the skills, knowledge, abilities and confidence step by step so that upon completion, the successful student can positively and confidently offer their services as a PROFESSIONAL ANIMAL ENERGY HEALER - and make a real difference in the lives of animals and the people who love them. I am best known for my work with people, modern energy work and advanced creativity, but what many people don't know is that I used to work as a behaviour specialist with animals and their owners for many years. When I came into the "people field," it became more and more clear to me that having worked with animals for all this time was the BEST education I could ever have received. Animals don't lie, they don't make up stories, they don't play games. When they are unhappy in mind, body or spirit, they will let you know. And quite frankly, I now advise people who are interested in learning energy healing for humans to start with animals, because that's a much safer path - you get proper, reality based feedback on what you are doing. When you are doing energy work with a horse that was all tense and tight, and you can feel that energy rising and a few seconds later, the horse breathes out this long sigh of relief, and you can see how its spine is stretching out, the whole animal is relaxing all over and closing its eyes - well, then you know exactly what you have just done. You've made a change, you made a difference to this animal. It's an extraordinary sensation for "the healer" and each and every time this happens, you know that you are learning, you are evolving, and you are doing an amazing thing that is never second best to either being a vet, or a people healer. Frankly, I see that as nothing but a beneficial side effect. When this spirit is injured, hurt, damaged, the animal suffers in a very different way from "physical illness." 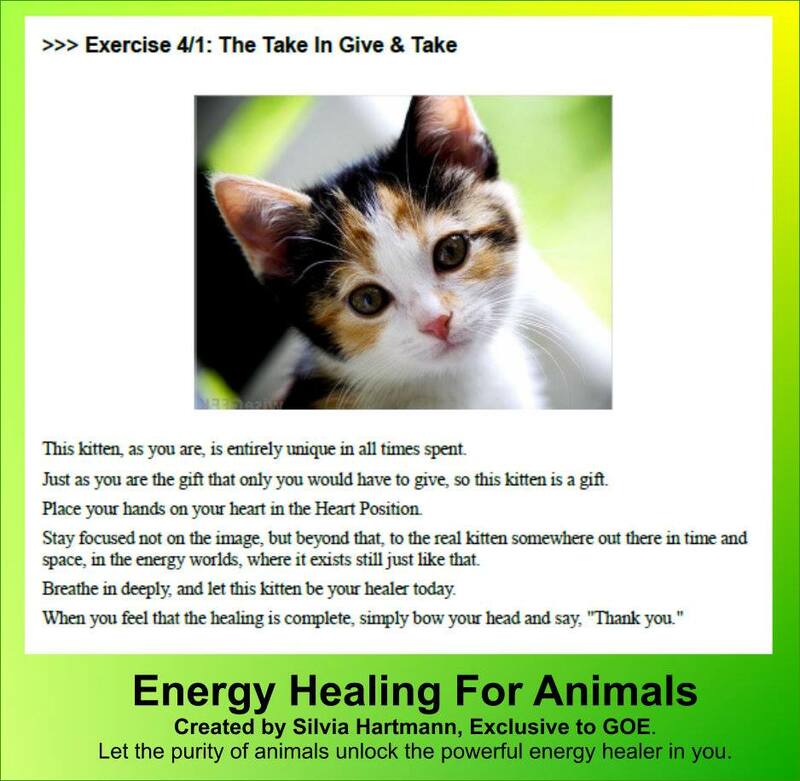 As energy healers for animals, we don't fix broken bones or promise miracles of physical healing. We might be the only ones, ever, who have tried to do something for that animal's spirit. It's a wonderful thing, a holy thing - and oh! so, so much needed in the world today. I would love for you to "go out there and do that energy thing" - that's what this course is about. It's about understanding and certainty about what you're doing, what you are promising, what you can achieve; and it is about the practical applications of going out into the real world, head held high, as a real Energy Healer For Animals. If animals are your passion, and if you understand what I've said here, not with your head so much as with your heart, then I encourage you to go forth, do this course, gain your certification, put your cards in pet shop windows and go help animals in spiritual - energetic! - distress. Bring more light and love into the world, and in so doing, transform yourself with the help of the animals you encounter on your path. It's a most wonderful journey to take. 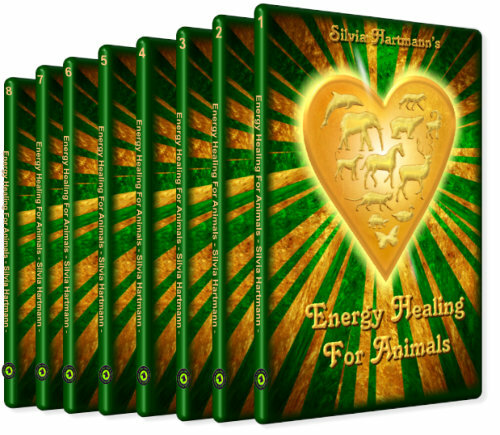 Energy Healing For Animals was created by Silvia Hartmann, Trainings Director of The Guild of Energists, author of Modern Energy Tapping, Energy EFT, EMO Energy In Motion and Infinite Creativity. This is a beautiful course for all who love animals. This course is designed to make it easy and natural to learn. This is a practical course for down-to-earth people, wanting to work with animals in the real world. The units and exercises are concise and to the point. 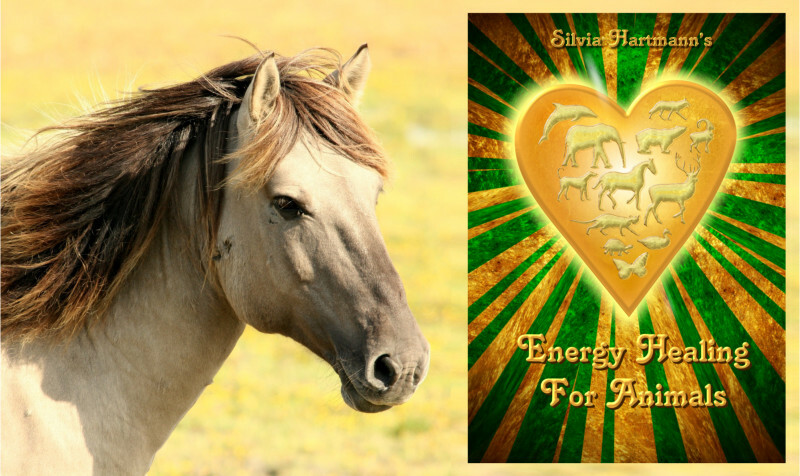 To be an amazing energy healer for animals, you have to have your heart in the right place. you have found the right course. 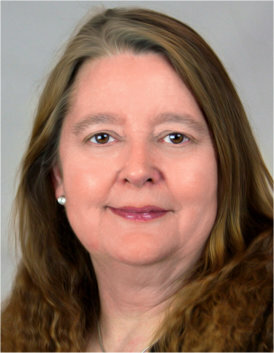 Barbara Saph is an experienced GoE Trainer's Trainer and has been teaching Energy EFT, Positive EFT and EMO Energy in Motion from Southampton, UK, since 2008. "I have had a great love and affinity with animals all of my life, I find them fascinating, elegant and beautiful on so many levels. If you fully allow animals energetically into your life the results can be life changing," said Barbara. "I would dearly love to help people begin to develop a deeper understanding of animals and find a way to live and work with them in harmony so both have more enjoyment in life." 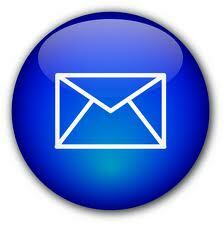 To contact Barabara about the course, click here. Start your Energy Healing for Animals journey TODAY. You may choose the route that is the most convenient to you. The qualification and certificate is the same. To keep the cost of the distance learning course down for the majority of students, we ask everyone to arrange their own finances before enrolling. Study one unit at a time. Each unit has on average four short assignment upon which the student supplies a written report in their own words, telling of their own experiences with the assignments. The tutor will respond and pass the student if they are satisfied that the core skills from the unit have been demonstrated. When the unit is passed, the student moves on to the next unit until all eight have been completed and the successful student is issued with their certificate. 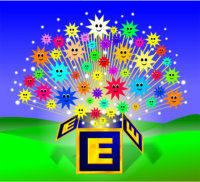 You may purchase an additional six months of tutor support for an extra £75.00. This also includes an extra six months worth of GoE Standard Membership, so you'll still have access to member downloads, member only groups and receive The Energist Magazine. For further information please contact the GoE office.